In 2007, there were very few bike racks in town, most of those deteriorated and in inaccessible places. In that year, the Bikeways Committee, active since the 1970s, began a three-phase, multi-year project to install new, state-of-the-art bike racks that would be standard throughout town – inverted U, durable, low-maintenance racks set in concrete pads. 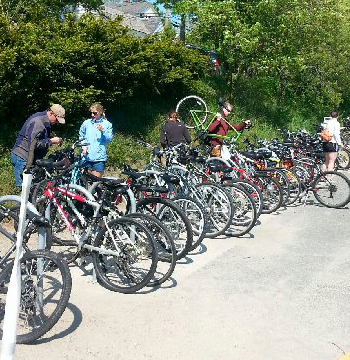 Conveniently and widely located bike racks would support passive and active recreation in the natural environment for residents of all ages and Falmouth’s hundreds of thousands of visitors each year. The Committee also saw the provision of stable platforms for securing bikes as an essential component of its mission to make Falmouth qualify as a bicycle-friendly community and to demonstrate biking as a viable transportation option. It was a good year to start this multi-year project. The public schools had applied to the Massachusetts Highway Department to join the Safe Routes to School Program. The Chamber of Commerce reported that one of the most frequently asked questions was “Where is the Shining Sea Bikeway?” The Bikeways Committee had partnered with the Chamber of Commerce to encourage businesses and nonprofit institutions to install bike racks or provide funding to install them at their locations, accessible to the public. Town Meeting in 2007 appropriated $33,000 for Phase I and the Department of Public Works oversaw the installation of bike racks at twenty-three locations, including the ferry terminal and Shining Sea Bikeway, Trunk River, Old Silver Beach, Wood Neck Beach, Bristol Beach, Gus Canty Community Center, Goodwill Park, Trotting Park Fields, Taft Park, Nye Field, Little League Field, Teaticket School, North Falmouth School, West Falmouth School, Fonseca Field, the Band Shell and Harbormaster’s Office, and East Falmouth Library. Total cost of Phase I was $38,590. In addition to the $33,000 from the CPFund, the Bikeways Committee received $2,090 from the Woods Hole Foundation. In 2008 it requested and received an additional $3,500 from CPFund to install racks at the Sandwich Road playing fields. The Bikeways Committee has a small annual maintenance budget to supplement that of the Department of Public Works for bikeway facilities. See Phase II, funded in 2014, and Phase III, funded in 2015.